There are many factors that can make or break a fishing trip using lures. Lures depend on a variety of conditions and the results vary from day to day. 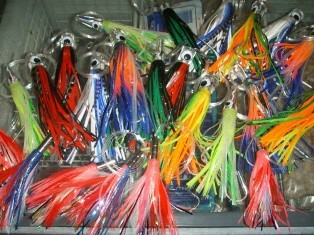 Popular lure colours have been a combination of red and white, blue and white, red and blue, and lastly green and yellow. It is best to use a dark lure on a dull day; blue or pink are very popular during these conditions. When you come across a shoal of game fish feeding you should avoid trolling straight through the shoal as this will scare the fish and cause them to scatter. Steer the boat parallel to the shoal and when you have passed the shoal then turn the boat and travel through the place that they were feeding. This will entice the game fish and cause them to chase your lure. 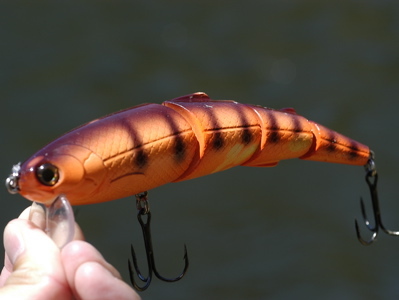 These lures are made in a large selection of colours, but the redhead lure seems to be the most popular with anglers no matter where you fish. The shape, size and angle of the plate on the wobbling type of lure will influence the action of the lure while in the water. The further bend down, the deeper the lure will run. A wobbling lure that is not swimming properly can cause trouble as it has two sets of hooks which can get tangled and render the lure useless. Always remember to choose a trolling pattern that is least likely to cause tangles. The pattern that you choose will often depend on the state of the sea and the strength of the wind. Select your lures according to the weather conditions. If fish are not biting then experiment with different lures and you might want to adjust your trolling speed. Remember to keep your hooks sharp! !